Habitat: It appreciates the humid ambiences of Brittany and Normandy. Fruit: upright, in the form of strawberry (hence the nickname of the shrub: "bear-strawberry"). 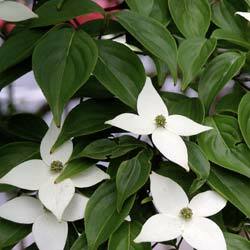 Dogwood of pagodas or controversial Dogwood (Cornus controversa). Height:It can attain 20 m which makes a true tree, but most often, in Europe, it does not exceed 7-8 m tall. Spreading Form. Its branches are graduated. Habitat: sunny. Deep, not calcareous, well-drained soil. Deciduous foliage. 10 cm leaves, obovate blade, smooth, light green margin. Fine leaves (finer than those of the American Flowering Dogwood). Flowers: small cymes of upright white flowers. There is a variegated, very decorative variety.